The Real Reason Not to Chew with Your Mouth Open! Last week I attended a very interesting seminar and press event presented by Valrhona chocolate to introduce a very impressive new book: Cooking with Chocolate: Essential Recipes and Techniques (Book & DVD) This beautifully produced book was originally published in French under the title: Encyclopedie du Chocolat and has just been published in English by the same publisher, Flammarion, with an accompanying DVD of techniques. It is a book written by professionals for both the professional and the home baker and cook. It includes both sweet and savory recipes and, dear to my heart, the ingredients are listed in grams, ounces, and volume. It is replete with enticing photographs, creative ideas and recipes, and precise techniques. Pierre Hermé, in his foreword, writes: ...For many long years, pastry making was a demonstrative art with a decided tendency toward ornamentation...Today's pastry chefs focus on taste, flavors, textures, and temperatures. 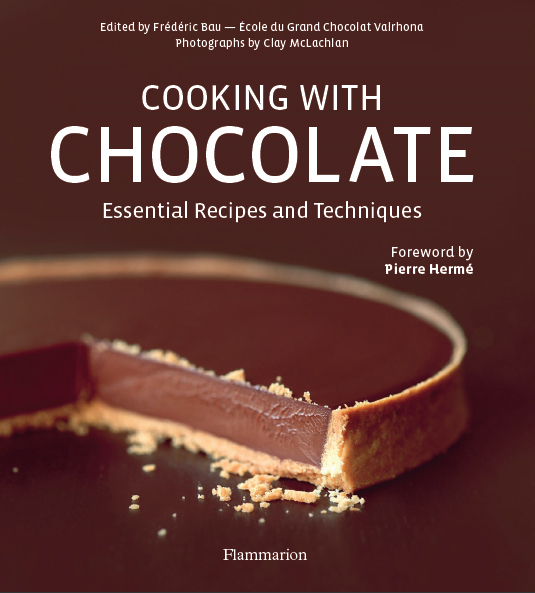 Years ago, whenI asked my dear friend the esteemed chocolatier Jean Françoise Bonnet now of Tumbador Chocolate, what his favorite cookbook was he told me it was a book published in France by Frederic Bau. Au Coeur des Saveurs (English/French Edition) Frederic Bau, who is is the long time director of L'école du Grand Chocolat du Valrhona, also edited Cooking with Chocolate. As part of the Valrhona chocolate tasting, food scientist Vanessa Lemoine of Valrhona instructed us as to taste chocolate to its best advantage. Most of us, being food professionals, already knew this but being reminded served to suggest to me that it would be a very valuable tool to share with all of you. The technique works not just with chocolate but with any food and wine as well with slight modification. Start by smelling. Then chew to release the flavor. (The intial flavor is floral) Hit your tongue against your palate. (This releases mid range earthy flavors.) Finally, with your mouth closed, breath out through your nose. (This releases a whole new range of spicy flavors. Here's the best reason yet to listen to what your mother often repeated about chewing with your mouth closed!) You'll be astonished as to the variety, range of flavors, and enhanced pleasure you will experience by occasionally paying this close attention to what you eat, especially when it's chocolate.